About a week ago two bootleggers joined battle again. 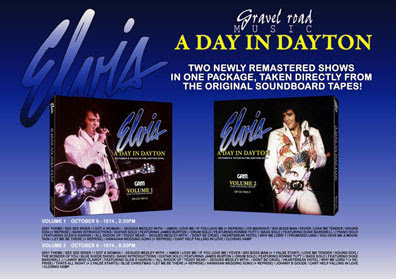 Barely had The Gravel Road Music import label announced a double CD set called A Day In Dayton, featuring Elvis' two performances from October 6, 1974, when a new label called Boxcar (created by International and DAE) let us know that they would release the same two shows together with a book under the name of Dayton Reloaded. Obviously, it's no coincidence that these two labels release the same shows simultaneously, and as double CDs as well. At least one of them (I bet both!) has to know what the other one is doing, and is rushing to do the same thing, only sooner. How they know about each others plans, I have no idea. I also don't know how they both come to have what they claim to be the original soundboard tapes in their possession. One thing I know, however, is that the battle between these two import labels (my guess is that it's the same guys running both Audionics and Gravel Road Music) is leading to very professional products, that are miles ahead of FTD when it comes to cover art and booklets. Usually the booklets are packed with photographs from the shows in question and has well written liner notes. 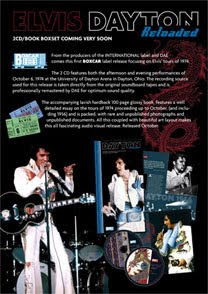 One such example is the recent release from Gravel Road Music titled The Return Of A Prodigy (featuring Elvis dinner show from August 3, 1969), that includes a booklet 32 pages thick with over 50 shots of Elvis on stage, as well as a review from a fan that was lucky enough to see an Elvis show at the International Hotel 40 years ago. For the millionth and the last time: How I wish FTD would learn from this. As long as the label doesn't, I can understand the fans having a hard time keeping their hands away from releases such as The Return Of A Prodigy. Of course, there is always the problem with which one to choose if two battling bootleg labels release the same show. Maybe FTD hopes that the fans will be so confused that they'll buy neither. Or on a more serious note, maybe the strategy is to let the bootleggers drive each other out of business. So far, it hasn't been working.